Kate (Hess) and her husband (?) 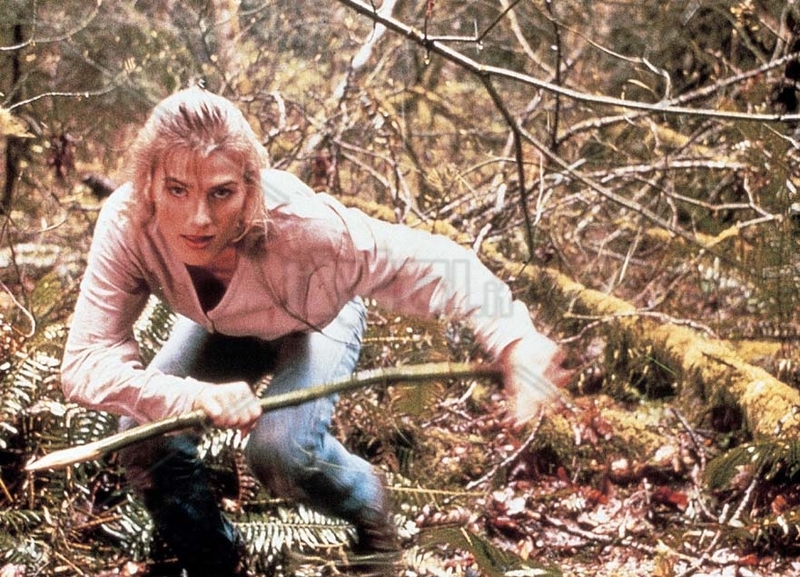 Neil (MacLachlan) decide to go camping in the wilderness outside of Seattle. Neil obviously taking up the challenge because he’s such an enthusiast of Postal Carrier-style shorts. While enjoying their sojourn, a passel of punks decide to ruin the fun. Assaulting Kate and Neil, Kate goes on the run in the woods. While there, she runs into DeVoe (Kove), a man dressed as some sort of indeterminate Indian. What are his true motives? Meanwhile, the Sheriff of the nearby town of Wilkeson, Shirley (Aiello) wants his own answers for all the goings-on in the woods, so he embarks on his own expedition into the harsh and unforgiving lands. Will anyone make it out alive? The reason why we checked out Endangered is because we’re fans of Martin Kove. As we discovered, there’s really no other reason to seek out this boring wilderness slog. And it’s a total waste of Kove at that, as he gets very little screen time. In addition, his character, like the movie as a whole, is poorly written and conceived. Presumably influenced by I Spit On Your Grave (1978) and possibly even Savage Instinct (1991), Endangered has none of the qualities that enliven those movies - it just meanders and goes around in circles. It’s director Kellis’ only feature film to date, and it’s easy to see why. He does manage to get some celebrity siblings on board - Rick Aiello is Danny’s son, and Renee Estevez, who is Martin Sheen’s daughter and Charlie Sheen’s sister, has a very small part as well. We get to see some all-too-brief Rick Aiello-Fu at one point, and Kove’s getups are something (buckskin fringed jackets and wild Indian-style ponchos, etc. ), but there’s so much dumbness on show, these bright spots get lost. Not enough actually HAPPENS in this movie, and you don’t care about the characters one way or another. Even as they try to survive, it’s hard to care because they’re all victims of bad writing. Even when one of the head punks causing all the terror rips the scrunchie off his ponytail in anger, despite the fact that it’s a power move to show you’re upset (hey, we’ve all been there, right?) it’s still hard to care. Sad, really. And because it was 1994 and set in the environs of Seattle, naturally during the credits there is a Pearl Jam-like “grunge” tune that plays. Pretty predictable. You could always tell it was the mid/late-90’s in DTV land because the music moved to a more grunge style, away from the more AOR style of the 80’s. See Overkill (1996) and Food For Feet as an example. We see this as an upsetting change - give us Steve Butler and “Always On My Mind” or Joe Lamont’s “Quiet Cool” any day of the week. Unfortunately, that’s another weak point for Endangered and the straw that broke the camel’s back, really. Sadly, we cannot recommend Endangered. Even Kove fans are likely to be disappointed. I thought this was a pretty good film and I actually did care about the characters, Sandra Hess was really good as well. Where's Sandra Hess now? She should come back to movies! Also it definitely needed more Kove. Hess was on General Hospital for awhile, her most recent role was a guest appearance on CSI:NY last year. OK, you've been very clear in your warnings about this film, but then you go and dangle the prospect of Martin Kove dressed up as an "indeterminate Indian" in front of me. I'm not sure I can resist!!! Haha! Kove is the best part of this...just have to endure a lot before he gets on screen.